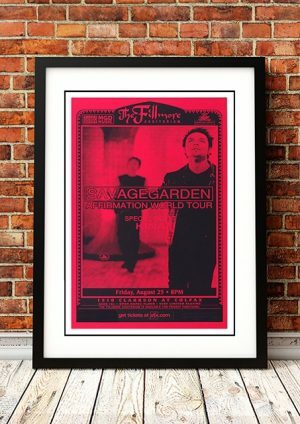 Classic Savage Garden Band Concert Posters and Memorabilia! Buy Online Now! Calling themselves Crush, they sent 150 demo tapes all over the world and waited patiently for replies. The only positive response came from Australian music identity John Woodruff, who had previously managed the Angels and Baby Animals. Woodruff secured a deal with film distributor Roadshow’s record label offshoot, an independent distributed by Warners with no proven track record. He put the duo in the studio with Australian producer Charles Fisher, who had previously created international breakthrough hits for Air Supply and Moving Pictures. When the self-titled debut album was released in April 1997 it entered the charts at number one and notched up 13 weeks at the top, the third longest stay for any Australian-made album. In the meantime, a Dallas radio station had started playing “I Want You” and the duo was signed to Sony’s Columbia imprint. “I Want You” and “Truly Madly Deeply became worldwide hits, the latter achieving number one in the U.S. in January 1998. The album sold 11 million copies globally and earned Savage Garden ten Australian ARIA Awards. 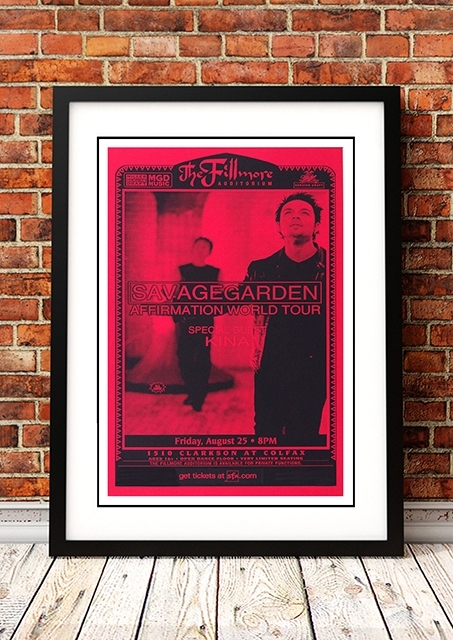 We stock some awesome Savage Garden Band Concert Posters.